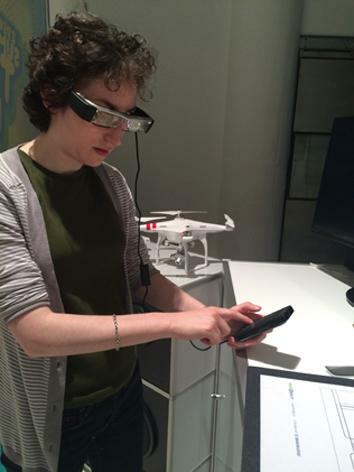 A look at smart glasses from Atheer Labs and Epson Moverio. Are Smart Glasses Really a Thing That’s Happening? 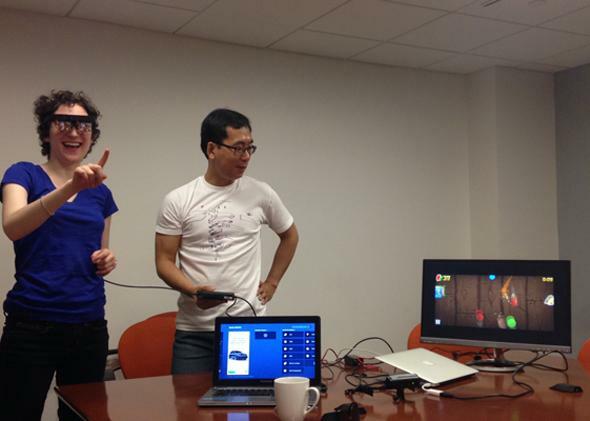 Allen Yang, the CTO of Atheer Labs, helps me play fruit ninja in the air using smart glasses (the far right monitor shows what the glasses are displaying). Did you know that there are Google Glass competitors? Other smart glasses that project a screen in your field of view? I didn’t. I guess I was vaguely aware that if Google is doing something, other companies must be trying it, too, but I wasn’t focused on it. Which was dumb of me. It’s been a year since I first tried out Glass and two years since Google started talking about the product. That’s a lot of time in tech development terms—enough time for ideas that were nascent in 2010 or 2011 to turn into prototypes and even pilot programs. So in the past couple of weeks I decided to catch up and tried two different versions of smart glasses, offerings from Atheer Labs and Epson. But what are they for, and do they work? Google Glass is primarily a consumer device that does similar things to a smartphone. You can write emails, read notifications, view Google Maps information, get directions, etc. There are professional uses, too: For instance, medical workers are trying out Glass for things like easily accessing patient information in a hospital setting. Smart glasses seem like a logical next step in the evolution of smart devices because they can get infinitely small without sacrificing immersion. As Soulaiman Itani, the founder of Atheer Labs, notes, the devices we use now—like smartphones, tablets, and laptops—are redundant. What they’re each offering is a different degree of portability vs. screen size. They’re also inherently contradictory because we want them to get smaller and lighter without sacrificing their ability to display content or our ability to control them. With smart glasses, the display can get bigger, better, and sharper while the physical technology contrinues to shrink. Both Atheer and Epson are mainly marketing their smart glasses for professional settings. In fields like manufacturing and medicine, there’s a big need for all-in-one solutions, and attractiveness of the glasses and their software isn’t as important as it is in the consumer market. Furthermore, workers have to train extensively with any new tool anyway, so it doesn’t matter as much if it takes a little while to get comfortable using the glasses. Atheer has partners in construction that are doing things like aerospace design or civil engineering; Epson has automotive and appliance companies doing marketing and repair training with employees on the glasses. The idea is to replace tablets that require people to continuously look up and down, and also take advantage of the context-aware features in smart glasses that allow people to see and interact with 3-D renderings. Trying out Epson’s Moverio glasses. You control Glass using voice commands and gestures on the side of the device near your right temple. The headset from Atheer Labs uses voice, head motions, and most importantly a touchscreen transposed onto the air for commands. Basically a camera mounted on the glasses tracks your fingers and does depth calculations to figure out when you’re “tapping” something you’re seeing in your glasses. And the Moverio headset from Epson has a few touch inputs on the glasses themselves but mainly uses a physical trackpad to control a cursor. All three devices are at different stages of actual functionality. Glass accepts commands pretty well once you learn the system of swipes and taps, though Glass offers audio output for things like phone calls that can be hard to hear in places with a lot of ambient noise. 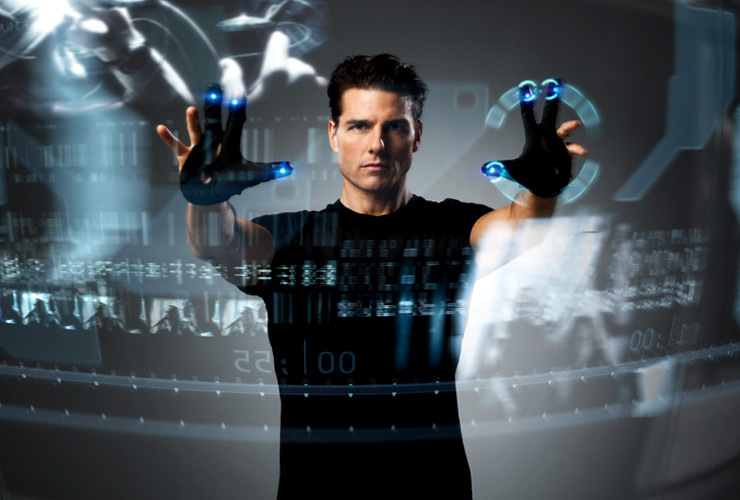 The glasses from Atheer Labs are the most impressive in terms of presenting elegant solutions that put you in control and make you feel like you’re in Minority Report. (In the top photo I’m swiping away at the air while playing Fruit Ninja on the glasses. Fun!) But the tech needs to develop more to feel stable and reliable. With the Moverio glasses, the battery and trackpad are in a little brick that you keep in your pocket, and it’s wired to the glasses. It’s a less futuristic solution, but certainly makes sense in the short term since getting long life out of a tiny battery is still a problem. It’s also a more intermediate step between current mainstream tech like laptops and the glasses of the future. The trackpad-and-cursor approach feels familiar in a good way. The problem is, the Moverio’s trackpad didn’t seem quite as sensitive and responsive as I wanted it to be, so using it was a little distracting. Right now the technology is still limited, but unlike smartwatches that have yet to convince me of their usefulness, I could easily see how smart glasses could seamlessly enhance lots of situations. Google Glass famously costs $1,500 and is now available to anyone, though the product is still in beta and hasn’t had its commercial release. Epson’s Moverio glasses are already on the market, and you can order them for $700. I wouldn’t buy any of these now, but if, like me, you hadn’t really thought about whether smart glasses other than Glass were even in development, consider yourself put on notice: They’re definitely here and they’re getting awesome.